Each new message that arrives is stored in the Inbox folder’s message list and appears in a bold font. To view the contents of any message, select it in the message list and Outlook Express then displays the message text in the preview pane. If you find the preview pane too confining, you can open the selected message in its own window by double-clicking it. To open the attachment: Click the preview pane’s paper clip icon and then click the name of the file. To save the attachment: Click the preview pane’s paper clip icon and then click Save Attachments. You can also select the File, Save Attachments command. Moving a message to a different folder. To move a message to another folder, use your mouse to drag the message from the Inbox folder and then drop it on the destination folder. Saving a message— Instead of storing the message in a folder, you might prefer to save it to a file. To do this, select File, Save As and then use the Save As dialog box to select a location, enter a filename, and select a file type. Saving a message as stationery— If you receive a formatted message and you like the layout, you can save it as stationery for your own use. To do so, select File, Save As Stationery. Printing a message— To print a copy of the message, select File, Print. Replying to the Message Author This option sends the reply to only the person who sent the original message. Any names in the Cc line are ignored. To use this option, select Message, Reply to Sender or press Ctrl+R. You can also click the Reply button on the toolbar. Reply to All of the Message Recipients This option sends the reply not only to the original author, but also to anyone else mentioned in the Cc line. To use this option, select Message, Reply to All or press Ctrl+Shift+R. You can also click the Reply All button on the toolbar. Forward Select Message, Forward, press Ctrl+F, or click the Forward toolbar button. The full text of the original message is inserted into the body of the new message and a greater than sign (>) is appended to the beginning of each line. Forward as Attachment Select Message, Forward as Attachment. In this case, Outlook Express packages the original message as an attachment, but it makes no changes to the message. The user who receives the forwarded message can then open this attachment and view the original message exactly as you received it. Deleting a message— To get rid of a message, select it in the folder and then press Delete (or Ctrl+D) or click the toolbar’s Delete button. If the message is open, press Ctrl+D or click the Delete button. Note that Outlook Express doesn’t really delete the message. Instead, it just moves it to the Deleted Items folder. If you change your mind and decide to keep the message, open the Deleted Items folder and move the message back. To remove a message permanently, open the Deleted Items folder and delete the message from there. Select View, Columns. (You can also right-click any column header and then click Columns.) 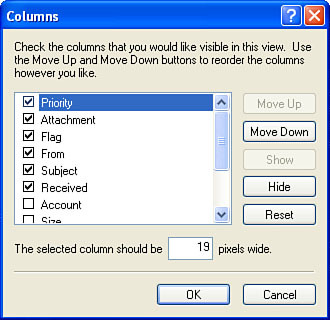 Outlook Express displays the Columns dialog box, shown in Figure 1. Figure 1. Use the Columns dialog box to customize the columns displayed in the message list. To add a column, either activate its check box or select it and click Show. To remove a column, either deactivate its check box or select it and click Hide. To control the width of a column, select it and then enter a new value in the The Selected Column Should Be X Pixels Wide text box. To change the width of a displayed column, use your mouse to drag the right edge of the column’s header to the left or right. To change the width of a displayed column to fit its widest entry, double-click the right edge of the column’s header. To change the position of a column, use your mouse to drag the column’s header left or right. To help you work with your correspondence, Outlook Express has a number of options related to reading messages. To view them, select Tools, Options to open the Options dialog box, and then display the Read tab, shown in Figure 2. Figure 2. Use the Read tab to set various properties related to reading messages. Mark Message Read After Displaying for X Second(s) Deactivate this check box to prevent Outlook Express from removing the boldfacing while you’re reading a message. Alternatively, you can use the spin box to adjust how long it takes Outlook Express to remove the bold (the maximum is 60 seconds). Mark As Read— Turns off boldfacing for the current message or messages. Alternatively, press Ctrl+Q or Ctrl+Enter, or right-click the message and then click Mark as Read. Mark As Unread— Turns on boldfacing for the current message or messages. You can also press Ctrl+Shift+Enter or right-click the message and then click Mark as Unread. Mark Conversation as Read— Turns off boldfacing for all the messages in the conversation associated with the current message. (A conversation or thread is a group of messages that have the same subject line, ignoring the Re: and Fw: prefixes added to replies and forwards.) Alternatively, press Ctrl+T. Note that for this command to work, you have to group messages by conversation by selecting the View, Current View, Group Messages By Conversation command. Mark All Read— Turns off boldfacing on all messages in the current folder. You can also press Ctrl+Shift+A. Automatically Expand Grouped Messages When you group messages by conversation (by selecting the View, Current View, Group Messages By Conversation command), Outlook Express displays only the first message in the group and includes a plus sign (+) to its left. You need to click the plus sign to see the other messages in the conversation. If you prefer to see all the messages in the conversation automatically, activate this check box. Automatically Download Message When Viewing in the Preview Pane When you’re working with a Web-based email account (such as Hotmail) or a newsgroup, deactivate this check box to prevent Outlook Express from downloading message text when the message header is selected. When you’re ready to receive the text, press the spacebar. Read All Messages in Plain Text Activate this check box to convert all HTML messages to plain text, which helps to thwart web bugs and malicious scripts. Show ToolTips in the Message List for Clipped Items When this check box is activated, Outlook Express displays clipped information (such as a subject line that’s cut off at the end because the Subject column is too narrow) in a ToolTip when you hover the mouse pointer over the item. 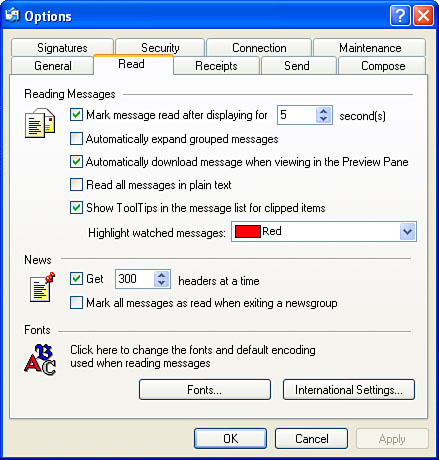 Highlight Watched Messages Use this list to specify the color that Outlook Express uses to display messages marked as watched. To mark a message as watched, you first need to display the Watch/Ignore column Then click inside the column beside the message to add an eyeglasses icon to the column and to format the message in the specified color. Fonts Click this button to display the Fonts dialog box, which displays a list of the character sets installed on your computer. For each character set, you can specify a proportional and fixed-width font, as well as a font size and encoding. You can also specify which character set to use as the default. International Settings Click this button to display the International Read Settings dialog box. Activate the Use Default Encoding for All Incoming Messages to apply the encoding shown in the Default Encoding box to all your messages.